Blue Spoon – Little. Blue. Delicious. I never hear anyone talk about Blue Spoon. Maybe it’s because I don’t talk to anyone. Maybe it’s because they only have five or six tables and even fewer bar seats. Maybe I’m afraid of the way I love you. But whatever the reason, I had to get back to the tiny restaurant on Munjoy Hill so I could remember what the place was all about. My last time there, the restaurant made me feel very “at home” as did the tiny, well-stocked bar and I thought that might be a feeling I’d like to experience again. We arrived with a couple of friends in tow and I couldn’t help but notice that the sign out front was blue with a…wait for it…white spoon. Confused and conflicted, we entered the restaurant and were promptly taken to our table for which we had reservations. We were given some nice looking food and drink menus, greeted by our waitress, told of a couple rotating beers that were not on the menu, and left to our own devices while we made some important decisions. As my mind swirled around the drinkosphere, I considered a cocktail, but instead settled on a beer. When the waitress came to the table for our order, I chose one of the rotating options we were given, but it so happened that they were out. My next selection was the one that took it’s place – Bissell Brothers Baby Genius. Another beer and a couple wines were added to the order and the hunt was on for the perfect food items from the menu. The food menu had four sections – tapas, starters, salads, and dinner. Even though I was feeling a little picky, I still had my eye on several items to consume. I was leaning toward a tapas item and a dinner, but which one I would choose was a mystery. I put all the tapas items in my mind for consideration, shaking them like dice and hoping I wouldn’t roll snake eyes – that sounded disgusting. It was too confusing, so I worked on choosing a dinner first. Last time I was there, I had the Bistro Burger, but my wife gave high praise to the Chicken Under a Brick. Although it just sounded like squished chicken to me, I figured it would be something different to try, and I do usually enjoy poultry. 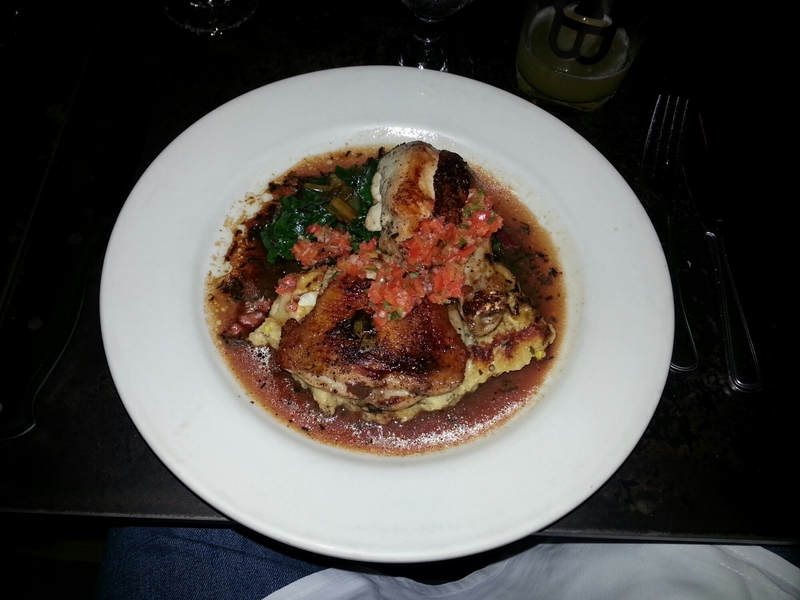 According to the menu, it came with pepper relish, polenta with fresh corn, Swiss chard, and honey sweetened chicken jus. Our drinks arrived and the waitress came back shortly after for our food orders. My wife and I ordered the brick chick. Then we threw in Crostini – one with ricotta and preserved lemon, and one with goat cheese and balsamic fig jam. For good measure, we added Fried Fingerlings with cumin and lemon aioli. Orders of some Chick Pea Fritters, “The Salad”, and Mushroom Risotto rounded out the table. Satisfied with our decisions, we sipped our drinks and anxiously awaited our kibble. Appetizers came to the table after a short wait. I tried a fingerling. They were great. The aioli was delicious and pretty standard except for the pronounced lemony zing which I enjoyed. The crostini were also top notch. Both were very tasty, though I preferred the one with goat cheese and balsamic fig jam. Our counterparts across the table had no complaints and seemed to enjoy their chow as well. After we were done our apps, the waitress came to take our plates away and apologized for the noise on that night. There was a large party which she said was causing the place to be louder than usual. It honestly wasn’t bad and just gave it the feel of a bigger restaurant with a larger crowd, but didn’t take away from the enjoyment of our time there. Even though part of the allure of Blue Spoon is it’s tiny dining room and quaint feel, I didn’t mind that it was more of a party than usual. After all, I consider myself a party person. There wasn’t much time between finishing our apps and receiving the main course. It was time to dig in. My chicken consisted of two bone-in pieces sitting on top of polenta in jus. It was topped with the pepper relish and Swiss chard sat on the side in jus. I took a bit of the chicken. It was very flavorful, tender, and moist – yep, moist. The pepper relish added to it and resembled a fresh salsa. I munched on the chicken for a while and then tried the polenta, knowing that I’m not generally a fan of the cornmeal product. I tried it. It was, in my assessment, tolerable, but still as good as any polenta I ever had. Then I added some pepper relish to it. Whamo! That was exactly what it needed. The polenta was reborn. Next I tried the Swiss chard. I’m also not a fan of cooked greens, so they were okay, but I would have been fine without them. Everyone finished their food and happily tapped out. There were no looks of disgust on anyone’s face. In fact, everyone enjoyed their meal greatly. Despite the fact that I ordered a meal where I wouldn’t normally like half the components, it was damn good and the main part of it – the chicken – was superb. Our meal and drinks came to about $145 before tipping but you could eat there for much less or much more. Prices of their items vary greatly and many can be ordered in varying portions. However, no matter what you get, Blue Spoon provides a really cozy atmosphere, great food, and primo service. You know what to do. Stop by today and tell ’em Peterpeterportlandeater sent you. This entry was posted in Portland, ME food on October 1, 2014 by peterpeterportlandeater.